Ritze Perdana 1 is strategically located at Damansara Perdana with easy access to Penchala Link, LDP & NKVE highway. It is close to the public amenities such shops, restaurants, supermarkets, IKEA and One Utama. 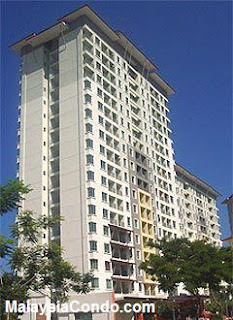 Ritze Perdana 1 consists of studio apartment and 1-room apartment units. The built-up area ranging from 382 to 634 sq.ft. Facilities at Ritze Perdana include swimming pool, gymnasium, jacuzzi, suana, children playground, BBQ area and landscaped garden. Built-up Area : 382, 406 & 634 sq.ft.